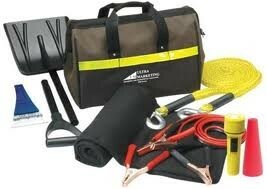 Part of being a healthy RV traveler is being as prepared as possible for whatever might come our way. Being aware of weather reports for wherever we are traveling is a good start, but that doesn’t guarantee that a devastating natural disaster will not occur while we are there. Tornadoes, hurricanes, severe thunderstorms and earthquakes are just a few of the natural occurrences that could put a serious damper on your road trip – or worse. An important step we should all take to make sure we are as prepared as possible is to ensure we have emergency supplies with us at all times. Of course, we will already be more prepared that most, since a well-stocked, self-contained RV is mighty handy to have around if disaster strikes. But we need to be ready for the worst if there are no power hookups in sight and getting more fuel is not an option, or if our RVs have been damaged. 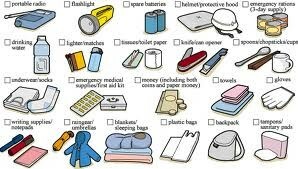 As mentioned above, most of us already include the majority of these items when packing our RVs for a trip. However, if you see something on these lists that you don’t already have in your RV, you should consider adding them to your list of needed supplies. If a natural disaster does occur while we are on the road, it is important for us to remember that we are likely better prepared than the folks who live in the area. Because of this, once you’ve made sure your family is safe and that you have what you need to survive in the aftermath, you should consider seeing if there is any way you can help out the locals. Great article. The information was very helpful for stocking up for emergencies. There were some things I had not thought of, but will add. Good post. I carry some but not all of the items on the emergency list (I never leave home without a rol of Gorilla tape), but it gives me ideas for more. Thanks! My MH (bought used last November) seems to really sip propane. I was on the original fill that it came with from the dealer, until this July. I’d never used the furnace and it’s usually on shore power (I have full hookups in my yard), but it was on gas sometimes. We used the furnace quite often during our 2.5 weeks on the road this summer (Black Hills, Yellowstone, points in between) on cool nights, and our campground in the Black Hills was dry camping, so the fridge was mostly on propane for 5 days there, as was the water heater. Even then, I didn’t get down to the 1/3 mark on my propane gauge until the I was only two days out on the return trip (Hurricane, UT). I would have made it home on that easily, but since I saw an Amerigas truck making the rounds in the RV park, I ran over and asked him to stop by my site. Very convenient, it was less than half the price Circus Circus gets for propane in their RV park (our last night’s stop), and you have to drive over to their tank. I follow the keep-it-full policy with my car, too. I never let it get very far below half a tank, in case of emergency. In San Diego, emergencies can include an earthquake that takes out the gasoline pipelines from LA, a major brush fire (in 2003, the Cedar Fire started in our local mountains, and in 24 hours it was within 2-3 miles of my house, 50 miles away in central San Diego), a terrorist attack on the gasoline pipeline (it’s buried of course, but that’s not much protection against a determined person or persons), or just a mistake by a backhoe operator. For that reason, I also keep my MH’s gas tank pretty full, and I put in fuel stabilizer at my last fill on the way home from a trip. If our house burns down, we can live in the motorhome. If we have to evacuate, I can hang the Odyssey on the tow bar and we can get out of town, just so long as the freeways are open. Oh, and I keep *three* fire extinguishers in my motorhome, and have smoke and CO detectors front and back.